I record nests of Unprotected (NON Schedule 1 bird species) for the BTO (British Trust for Ornithology) Nest Record Scheme. This helps the BTO in producing nesting data and highlights species which may need help through conservation work or even highlights success stories for certain species in the short or long term. 7.6.2016 10.35 a.m. 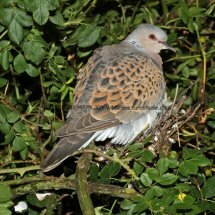 Saw my first a Turtle Dove of the year when it flew and settled and rested on an electric wire near the above area. 7.6.2016 1.30 p.m. Saw 2 Turtle Doves resting together on electric wires close to this area. 15.6.2016 4.11 p.m. Saw 2 Turtle Doves flying low along river. 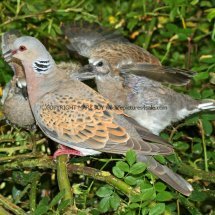 19.6.2016 Heard a Turtle Dove purring near me in thick riverside bushes. I began checking each bush and a Turtle Dove flushed from a Dog Rose bush close to the river. I looked into the bush and found a nest containing 2 eggs. Approx 1.8 metres off the ground. The front of the bush was quite open but a tall elder bush hid it from view from eye level. 25.6.2016 11.48 a.m. 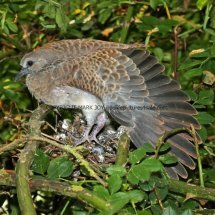 Approached the above nest very cautiously and observed from 20 yards through my camera lens the head of an adult Turtle Dove through a gap in the Dog Rose bush as it was sitting on the nest incubating the eggs. I left without disturbing it. 25.6.2016 1.45 p.m. 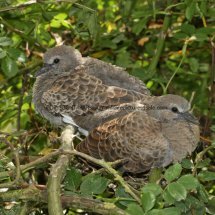 Searched half a mile away down river, checking every one of many bushes and thickets and a young, recently fledged, Turtle Dove flew out of a bush. 29.9.2016 10 a.m. 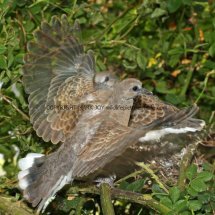 Approached the Turtle Dove nest, the sitting adult flew off revealing 2 young Turtle Doves on the nest, several days old. 30.6.2016 Set up my hide under the Elder bush near the Dog Rose bush containing the nest. 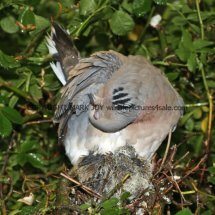 6.45 to 7.00 p.m.an adult Turtle Dove came and fed both young at the nest. Left hide set up there as it was very hidden and unobtrusive. 1.7.2016 8.35 a.m. Adult not on nest or in the vicinity. 2 young resting in nest and made clicking noises with their beaks as I walked past them to my hide. 10 a.m. an adult settled in a nearby bush and began purring. The young responded with some sounds back to it. It walked through branches from this bush to the nest and fed the young from 10.02 to 10.05 a.m.and remained standing on the nest near them until 10.15 a.m.
4.47 p.m.it began pouring with rain but the 2 young were very sheltered from it. 5.23 p.m. Heard an adult settle in a nearby bush and at 5.27 p.m.it was purring to the young as it rested on a Dog Rose branch a few feet from the nest. It fed both young together (2 beaks in its mouth and throat) from 5.27 p.m.until 5.29 p.m.and then stood near them on the nest. 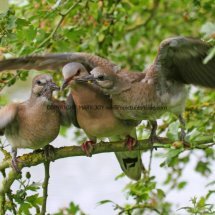 Rain had now started to drip through the branches so it sat on and brooded them both from 5.32 p.m. until 6.10 p.m. One was totally covered by the adult but the second one because of their growing in size was tucked at the front off the adults chest. It preened the front unhidden chick and itself as it sat there. It then walked along the branches out of the bush and flew to get more food. I waited a few minutes then left. 2.7.2016 8.58 a.m. Arrived and sat in my hide. No adults on the nest or in the vicinity. 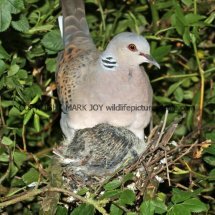 1.29 p.m. An adult Turtle Dove flew straight in and perched on a large Dog Rose stem in front of the nest and fed both young until 1.32 p.m.
6.18 p.m.an adult was purring nearby in a bush. It came to the nest and fed the 2 young from 6.30 to 6.32 p.m.and then left. I left a few minutes afterwards. 3.7.2016 8.00 a.m.arrived and went into my hide. No adults around. 8.17 a.m. An adult was purring nearby and walked to the nest after first settling in a close to Hawthorn bush and then flying onto the Dog Rose bush. It fed the young from 8.19 to 8.21 a.m. I left my hide at 11.30 a.m.
4.7.2016 1.25 p.m.arrived and went into my hide. No adults around. 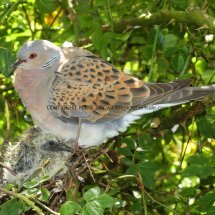 One of the young Turtle Doves on the nest had been making 'hungry tweets' at 2.10 p.m.so I guessed correctly that it wouldn't be long before the adults returned to feed them. I was proved right when at 2.19 p.m.an adult flew onto the right hand side of the Dog Rose bush and walked along branches to the nest and fed both young until 2.21 p.m. The next visit was just the same to the nest & the adult fed the young from 7.11 to 7.12 p.m. While the adults were away collecting food the young were preening themselves a lot now and flapping and testing their well feathered wings. When they knew the adults were nearby and coming to feed them they always became excited , standing up, even at a quite early age and also with much wing flapping, even more as they were older...often covering the adult's body with their wings! 5.7.2016 2.50 p.m.arrived and went into my hide. No adults around again. 3.45 p.m.an adult fluttered in and was purring in a nearby bush. It came to the nest and fed the young from 3.52 to 3.53 p.m.
6.39 p.m.an adult fluttered in and was purring in a nearby bush. It or its mate, came to the nest and fed the young from 6.44 to 6.46 p.m.
6.7.2016. 3.20 p.m. Got into my hide. The 2 young weren't standing or resting on the nest but were on a Dog Rose branch very close to it. 3.22 p.m.both young climbed back onto the nest. 4.32 p.m. 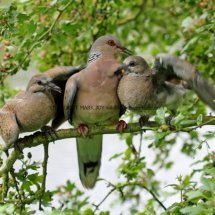 I heard both Turtle Dove adults settle in bushes on different sides of the Dog Rose bush. 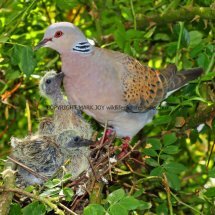 One was purring and walked in from the right and fed the young from 4.35 to 4.36 p.m.
8.20 p.m.an adult flew to the Dog Rose bush, both young rushed off the nest & down a large branch to meet it very close to my hide's hidden window. It fed them from 8.20 to 8.21 p.m.
7.7.2016 8.25 a.m.arrived at my hide. 11.08 to 11.10 a.m. an adult Turtle Dove came and fed the 2 young. 4.12 to 4.13 p.m. an adult Turtle Dove came and fed the 2 young. 9.7.2016 Today was the day that I was there to actually witness both young fledge! 3.50 p.m.arrived at my hide. 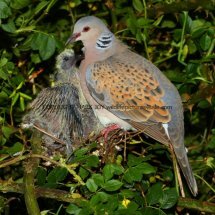 5.35 p.m. An adult Turtle Dove flew and settled in a Hawthorn bush just to the right of the nest on branches overhanging the water. 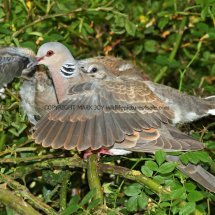 As soon as it began purring, one of the young Turtle Doves walked off the nest down a large bare Dog Rose branch and actually flew 8 feet from the nesting bush to land on a Hawthorn branch at the side of one of its parents. The other fledgling followed it straight away and landed on the branch, the other side of the adult! Both young had just fledged successfully! Their parent fed them then flew away, presumably to collect more food. 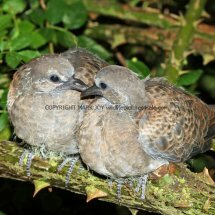 Both young birds sat happily side by side on that same branch while I packed my hide and equipment up. 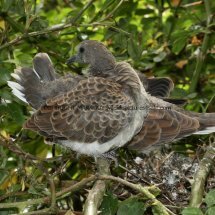 They had survived everything, including the many Magpies and Carrion Crows which , the summer before had decimated at the egg stage, the only 2 Turtle Dove nests in that area. Before I left them for the very last time, I said my goodbyes to them, thanked them for their company over the last two weeks and wished them well on their first long flight to overwinter in Africa. My parting words were 'take care and I hope to see you and your parents here next spring and summer'. Then I left, and I will forever remember my last view of them as they were cosily nestled next to each other on that Hawthorn branch.